AZA manages numerous large scale conservation initiatives that typically involve participation and collaboration amongst many AZA Committees,Scientific Advisory Groups, Animal Programs, and partnerships. These multi-faceted initiatives often include bothin situ and ex situ conservation strategies, research projects, education plans, and dissemination efforts. AZA recognizes that increasing atmospheric carbon dioxide (CO2), as well as other greenhouse gasses, is causing changes to the earth’s climate. These changes are impacting wildlife in the oceans and on every continent. AZA-accredited zoos and aquariums are trusted institutions through which millions of people learn about and value wildlife and nature. By communicating about the impacts of climate change on wildlife and habitats, AZA and its member institutions can play an important role in inspiring people to take personal and civic action that will help decrease atmospheric CO2 concentrations to protect humankind’s wildlife heritage. Read more about how AZA is addressing climate change and how YOU can help! At least one-third of amphibian species are threatened with extinction. AZA-accredited zoos and aquariums have spent more than $1.3 million on amphibian research and conservation projects in more than 20 countries. AZA, its Animal Programs, and its accredited institutions provide conservation and education resources, subsidize financial support, manage a citizen science program, and maintain partnerships with like-minded agencies to raise awareness of the amphibian crisis and promote amphibian conservation. Read more about Amphibian Conservation. FrogWatch USA is a citizen science program, coordinated by Chapters hosted by AZA-accredited zoos and aquariums across the U.S. FrogWatch USA allows individuals and families to learn about and conserve amphibians and wetlands in their communities as well as collect and report local frog and toad call data. Read more about AZA’s FrogWatch USA program. It is estimated that some species of apes will be extinct in as little as 20 years due to illegal hunting, habitat loss, disease and the pet trade industry. Currently two of six species and four of 11 subspecies of great apes are considered critically endangered; chimpanzee numbers have declined ~60% in the last 25 years; there are only 700 mountain gorillas remaining; 25% of orangutan habitat in Borneo was converted to palm oil plantations; and f ewer than 100 eastern black crested gibbons remain in the wild-making them the world’s most endangered ape. The AZA Ape Taxon Advisory Group developed an Ape Conservation Initiative that allows zoos to contribute to and help secure long-term populations of apes in their natural habitats. By working together and leveraging our considerable expertise, influence and resources, AZA-accredited zoos are becoming one of the most important agents of ape conservation. Activities such as anti-poaching patrols and law enforcement, the presence of long-term field sites and researchers, effective protected area management, community involvement, and data collection on population densities and distributions are crucial to the long-term survival of apes in the wild. Read more about the AZA Ape TAG Conservation Initiative. The Asian wild horse, Equus ferus przewalskii, also known as takhi and Przewalski’s horse, roamed the grassland steppes of Europe and Asia for millennia. But by the late 1960’s, it was driven to extinction in the wild due to human persecution, grazing competition, and high mortality from harsh winters. Thankfully, before Asian wild horses disappeared entirely, several zoos rescued more than a dozen individuals. Over the next several decades, zoos worldwide bred them and worked with in-country partners to reintroduce the descendants back to the wild. Today, there are more than 500 Asian wild horses running free in Mongolia and China. However, their numbers are not yet secure enough to withstand the normal environmental pressures of severe winters and predation. The AZA True Wild Horse initiative supports in situ research and conservation efforts for Asian wild horses and encourages AZA-accredited zoos to contribute to this work. Ultimately, the goal is to realize an expanded and stable wild horse population in their native habitat. Read more about the AZA Asian Wild Horse SSP Conservation Initiative. Thought to occupy less than seven percent of their original range, today’s tiger populations are threatened by habitat loss and degradation, poaching, tiger-human conflict, loss of prey, and other factors. Four of nine subspecies have disappeared from the wild just in the past hundred years and the Amur, Sumatran, and Malayan tigers are all thought to number fewer than 500 individuals in the wild. 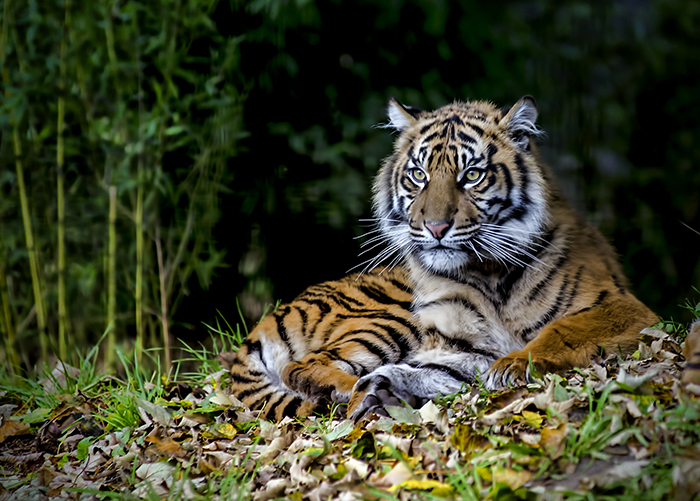 The AZA Tiger Species Survival Plan has published an Educators Guide and developed a Tiger Conservation Campaign that encourages AZA-accredited zoos to contribute to a selection of six tiger conservation efforts in the range states of Amur, Malayan, andSumatran tigers. Activities such as securing source sites for breeding tigers, ensuring high quality tiger protection is given to tigers in these source sites through robust ranger patrols and extensive intelligence gathering mechanisms, and monitoring of tiger populations, prey populations, and habitat extent and quality, are vitally important to long-term tiger conservation. Read more about the AZA Tiger SSP Conservation Campaign. Download the 2014 Tiger Conservation Campaign’s Annual Report. In the past 25 years, the in situ African elephant population has fallen from 1.6 million to less than 500,000–a decline of approximately 100 elephants each day–and the Asian elephant population has diminished to an estimated 30,000. AZA, its Animal Programs, and its accredited institutions provide superior elephant care and management strategies, maintain sustainable and genetically diverse elephant populations, develop elephant conservation and education resources, support elephant research and conservation initiatives, advocate on behalf of elephants, and maintain partnerships to raise awareness of elephant issues and promote elephant conservation. Read more about Elephant Conservation. AZA subsidizes significant financial support, advocates on behalf of marine mammals, and maintains partnerships with like-minded government and non-government agencies to raise awareness of marine mammal issues and promote marine mammal conservation. AZA, its related Taxon Advisory Groups, Animal Programs, and accredited institutions continually strive to provide superior marine mammal care and management strategies, maintain sustainable and genetically diverse populations, develop conservation and education resources, and support numerous research and conservation initiatives. Read more about Marine Mammal Conservation. Seventy percent of the Earth’s surface is covered by water. Oceans provide homes to an incredible amount of biodiversity, have the means to supply sustainable fisheries, and offer a plethora of human resources including the largest source of our planet’s oxygen. Environmental stressors are causing significant losses in ocean habitats and species but AZA, its Animal Programs, and its accredited institutions strive to raise awareness of ocean issues and promote ocean conservation by providing conservation and education resources, subsidizing research and conservation projects, advocating on the local, national and international levels, and maintaining partnerships with like-minded government and non-government agencies. Read more about Ocean Conservation.